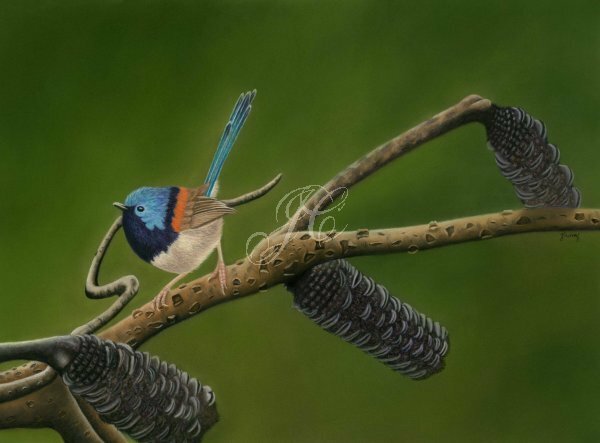 This is the 13th painting in my "Fairy Wrens of Australia" series. It features a male blue-breasted fairy wren (Malurus pulcherrimus) perched on a branch of a banksia. Blue-breasted fairy wrens are endemic to southern Western Australia and the Eyre peninsula in South Australia, breeding males have a bright violet-blue plumage on its head and down its back. They love dense shrubby vegetation in the understory layer of open woodlands, heathlands and mallee scrub, they are often shy little birds that are hard to spot as they flit around. They belong to a group of four very similar species of fairy wrens known collectively as Chestnut-shouldered fairy wrens, the other three species that make up this group are the Variegated fairy wren, Red-winged fairy wren and the Lovely fairy wren. Original Pastel painting created with artist quality pastel pencils and soft pastels on Clairefontaine pastelmat. Size is 25 x 35cm. Reference photo by Dreamstime. Original painting is framed and ready to hang as well as a range of Fine Art Giclee prints are available in a range of sizes.